If you drink soft drinks or sports drinks, such as Mountain Dew or Gatorade, keep reading. Since the Environmental Health News published this story last month, it has been picked up by Gizmodo (you can read that story here), The Huffington Post (you can read that story here), Scientific American, and many others. Our story begins with the chemical element called bromine. Bromine is a toxic, corrosive liquid named after the Greek word for stench (“bromos”). Pure bromine is a dark red color and gives off an extremely unpleasant odor. It is considered a hazardous material because it causes severe burns to the skin and its vapor is a strong irritant to the eyes, nose, throat. Although free bromine doesn’t occur on its own in nature, stores of it exist in the ocean, and it can be extracted through a chemical process. To “brominate” something is to combine it with bromine. Somewhere along the line, scientists decided to “brominate” vegetable oil and found that the resulting compound — brominated vegetable oil — worked really well as a flame retardant for plastics, a lead-eating additive for gasoline, a swimming pool sanitizer, etc. Around the world, the use of brominated vegetable oil (BVO) as a flame retardant is raising health concerns. Research shows that mammals exposed to brominated vegetable oil store up bromine in fat and muscle tissue. A study of 20 American mothers found that all had detectable levels of brominated flame retardant in their breast milk. Because bromine is a member of the halogen group, it displaces iodine. Iodine is a requirement to human life, and especially important in thyroid functioning. A deficiency of iodine is considered one of the leading causes of preventable mental disability. In animal studies, BVO exposure has caused reproductive damage; neurological damage; severe behavioral problems; and permanent organ damage to the heart, kidneys, and testicles. Most countries are clear on the fact that BVO is NOT a food. More than 100 countries have banned its use in food, including Europe, Japan, and India, and many are working to ban its use altogether — as a flame retardant in plastics, etc. The United States missed the memo and approved BVO as a food additive. The FDA never revisited brominated vegetable oil, never took into account the countless new studies that have emerged since the 1970s, including reports of its horrifying side effects on the unfortunate humans who have consumed too much Ruby-Red Squirt, and never re-evaluated the safety of brominated vegetable oil. As a result, since 1970, brominated vegetable oil has been hanging out on the FDA’s Interim list and added to American soft drinks and sports drinks. In the United States, food manufacturers found a special role for brominated vegetable oil in citrus-flavored soft drinks and sports drinks. Lightweight citrus flavors tend to float to the top of a drink, but bromine atoms are very heavy and help weight down the lightweight citrus flavors, so BVO is used a stabilizer that helps citrus flavors stay suspended in the drink for an even distribution of flavor. BVO also helps maintain the cloudy appearance of artificial citrus drinks that consumers equate with fresh-squeezed lemons. Even I have fallen to prey to believing that the lemon-colored haze of sodas has something to do with citrus juice. In actuality, that’s the magic of brominated vegetable oil. In fairness, when elements are combined, the properties of the individual elements may change; theoretically, harmful elements can become tolerable compounds and harmless elements can become dangerous compounds. Still, if we know bromine is harmful, who wants bromine atoms in their body? The same manufacturers using BVO as a food additive in the United States have found alternatives to brominated vegetable oil — better or worse, we don’t know — which are currently used in Europe. The decision to continue using brominated vegetable oil in the United States is a blatant disregard for public health. My prediction is that American soft drink companies will find a replacement for BVO very soon — not because new studies will surface that are any more damning than those already in existence, but because anyone who does a quick Google search of brominated vegetable oil will probably stop drinking citrus-flavored soft drinks and sports drinks. With the recent coverage of BVO gaining maintstream publicity so swiftly, that’s going to hurt sales. Cast your vote next time you go to the grocery store. Like the sweet taste of sports drinks? Add a splash of 100% fruit juice to your good old H20. Do you prefer drinks with carbonation? Add carbonated water to your 100% fruit juice. Worried about electrolyte balance? Although electrolyte balance may become important in extreme cases (marathons, ultramarathons, Ironman competitions, etc. ), many sports drinks don’t have the appropriate ratio of electrolytes to effect levels of electrolytes anyway. Good news: Your body is designed to balance its own electrolyte levels. In fact, some of the so-called “performance boost” athletes find from sports drinks may come from the brain’s response to the taste of sugar. If you’re an extreme athlete, consult with your coach, but remember, humans got along just fine before Gatorade. Just can’t give up sweetened drinks? At the very least, check the label. Don’t buy drinks with brominated vegetable oil (or BVO) listed as an ingredient. Even better, choose all-natural and organic drink brands. 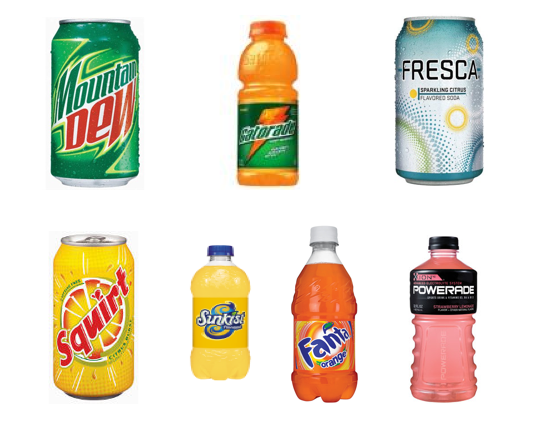 Drinks to Avoid: Mountain Dew, Squirt, Fanta Orange, Sunkist Pineapple, Gatorade Thirst Quencher Orange, Powerade Strawberry Lemonade and Fresca Original Citrus. Update: This issue is finally gaining mainstream attention! Read the New York Times article “Drink Ingredient Gets A Look,” published Dec. 13, 2012. Author WEPosted on January 6, 2012 April 29, 2013 Categories False Advertising, FitnessTags brominated vegetable oil, brominated vegetable oil side effects, bromine, BVO, drinks with brominated vegetable oil, electrolyte balance, iodine, iodine deficiency, pop, soda, soft drinks, sports drinks2 Comments on Soft Drinks and Sports Drinks: Would You Drink Flame Retardant?